Continuous Gutters or Seamless Gutters are gutters without any seams. The lack of any seams helps prevent leaks and makes your gutters stronger. Continuous Gutters also help make your home look better because they form on straight, seamless edge along the edge of your roof. TRS Gutters custom builds all of our continuous gutter systems right at your home or building. 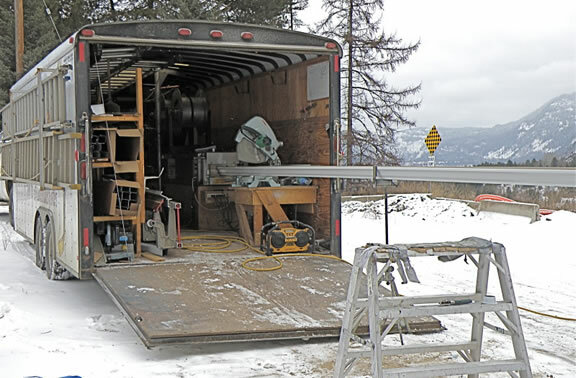 We come equipped with our mobile shop on wheels, with all the tools and materials to form everything for your seamless gutter system right on site. After inspecting your roof edges, and existing gutters (if you have them), we’ll then take detailed measurements of your roof edges. Once we’ve got all of the information we need, and we know everything we need to about your installation we’ll get to work fabricating your new seamless gutters. Aluminum: Aluminum continuous gutters are light weight, durable and won’t ever rust out on you. Usually they are painted to prevent oxidation of the Aluminum. Galvanized Steel: Galvanized seamless gutters are another good choice. They are stronger than Aluminum gutters but the trade off is that Galvanized steel gutters can rust. Especially around holes drilled for installations, seams, or anywhere that the bare metal is exposed. Galvanized steel gutters are also slighlty more expensive than Aluminum gutters. One of the issues we run into quite frequently when installing gutters on Kootenay homes is that their drip edges (flashing on facia to prevent water from getting between facia and gutters) do not stick out far enough. This causes a problem when the water gets behind the facia and actually rots it out. On many of our gutter jobs we end up having to make additional flashing for the homeowner to fix this issue. It’s a small detail that makes a big difference when protecting your home from preventable water damage.